Other bloggers - hands down the most inspiration. I just LOVE to save photos of my favorite girls on the blogosphere, pop them on my desktop, and re-open for inspiration when I'm feeling busted. French starlets like France Galle. Blair Waldorf? I could probably survive the apocalypse with my purse contents, but these three are most dependably present: lip balm, Blackberry, and travel mug. I like to be constantly caffeinated. High waisted circle skirts. So incredibly flattering and I love me some flounce. I have to say, I just cannot get into those fox tail accessories. I do not get it. I jumped on the bandwagon, so to speak! I had been visiting fashion blogs for years, drawing inspiration like crazy, and decided that I wanted to contribute something as well. I love to take photos, so outfit photos were a fun experiment of something new that I've ended up really loving. It depends. I have done the majority of my photos myself, with a tripod and self-timer, but as I've become more comfortable with the idea, I've branched out to have some friends, fellow bloggers, and my guy help me out. These always turn out far more animated, which is lovely, but I still sometimes like to go out and spend time with my hobby on my own. Very feminine. A mix of modern & vintage with quirky details. I like bold signature pieces, and these can change over the years. I also like to mix new with old, and cheap with "expensive" (well, my definition of expensive!). I have a few Spring wishes! I hope I can name more than one... Anything with a scalloped detailing - I am absolutely enamored with some pink scalloped shorts at the moment, as well as some floaty cream dresses. I'm also feeling drawn to simplicity via stripes, neutrals, cigarette pants, and plain black platforms. And statement necklaces - more & more oversized, layered necklaces. I wouldn't define myself as either, really. I like shoes and I like bags, but I love hairbands. What I refer to as "disposable clothing" - anything cheap and of poor quality that I buy for no good reason whatsoever, wear once (if that! ), and throw into the depths of my closet/on the floor. I made a resolution this year to try and stick to buying pieces of structure and quality so that I can build a smaller, but better wardrobe - so far so good! I'm sure Karl L. would be a trip. I have been fortunate enough to visit many parts of the world over the years, but have to say that the south of France was, by far, the most enchanting for me. I have a penchant for ornate details, the ocean, windowsill flowers, strong coffee, and pastries, so really, it was like a dream conceptualized! My ears are smaller than many newborn babies. So cute! I'm also over disposable clothing! She's got great style - I'm off to check out her blog! Awesome! She has such great ladylike style. I'm off to check out her blog now...and I'm glad I'm not the only one who doesn't understand the fox tails. I'm sooo in love with that blue coat!!! It's so lovely!! She is like a doll! LOVE her style! I'm delighted to meet someone else with small ears, too! She really reminds me of Alicia Silverstone. Will have to check out her blog! She is so cute! I love her blue coat and that black dress! I'm with Kristin...love her name btw. HAHA! I get so much inspiration from other bloggers. What a cutie! She is so damn cute. I just want to cuddle her. I love her style, so feminine and accented with some vintage, I am off to read her blog now. 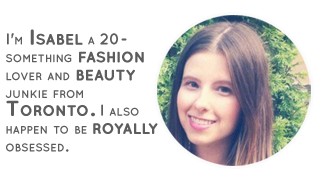 I love when you do these spotlights on other bloggers, so fun. she's pretty amazing:) thanks for sharing! She's adorable. I love these looks! So girly and chic. Another blogger I haven't heard of yet! I'll be sure to check her out. she's so fabulous! i've never seen her blog, but i'll be sure to check it out! Great interview. So cool this blogger only lives like 45 minutes away from me.